The Urban Warrior’s Way to Health, Wealth, Happiness and Good Looks! Our daily distractions literally limit our true capabilities because we never pause long enough to get in touch with those true abilities. The ancients didn’t live with our endless list of worldly (mostly technical) distractions, so they pondered deeply and learned how to tap their “real mind” in order to unleash their true abilities. They did it using Tao. The Tao is an understanding of all life, all energy. It's the generative force behind existence – that which makes the impossible possible! The foolish expend a great deal of energy and time trying to do everything and end up achieving nothing. On the other hand, the wise don't seem to do much at all and yet achieve whatever they want. This magic is possible, indeed unavoidable, when you tune in with the Tao. A person dwelling within the Tao excels in all their activities. The Tao makes you unstoppable in everything you do, because it gives you the power to access the source of existence itself. Think about existence. The fact that you're here, right now, is a total and utter miracle. And by “jumping into” the great current of life, the Tao, you can expand that miracle so that it grows like a great tree from a tiny seed, drawing in limitless positive energy from all around you and liberating all the strength, harmony, and genius that is sleeping inside you. In a moment I’m going to introduce you to one of most remarkable men I’ve ever encountered. When he first discovered the Tao, he knew instantly it was something he needed to share with others. The results he experienced so quickly made him realize he had to teach others about this remarkable way of living every single day. But you're not just going to learn the secrets of Taoism. You're also going to find out exactly how you can use the Tao in your daily 21st-century life ... to become an Urban Warrior! Are you ready to understand the most profound secrets of the universe and live the life you've always dreamed of? Just close your eyes and connect with the Tao. The magical transformation will begin just as soon as you start listening to The Urban Warrior's Way to Health, Wealth, Happiness, and Good Looks. You may have already heard of him. Perhaps you've read one of his bestselling books or newspaper articles. Or maybe you've seen or heard him on countless TV and radio programs. First and foremost, he is a very lucky person, just as you'll be when you find out how to attract luck using the Tao. He was truly blessed when he experienced a stream of extremely fortunate "coincidences" that allowed him to study, and later master, an extraordinary range of core spiritual and energy practices. So what, exactly, are you going to discover with the Urban Warrior's Way to Health, Wealth, Happiness, and Good Looks? 1. You'll discover simple, effective ways to increase your wealth: learn how to attach good energy to every penny you spend so that it circulates and comes back to you multiplied up to 1,000 times. 2. You'll learn to recognize and flow with the forces of Yin and Yang: Understanding how these flow through your body and your life gives you deep wisdom and a great ability to predict and control events. 3. You'll learn about the five elemental energies, and where to find them in your body: Understand these forces, and you understand the basis of all energy healing. 4. You'll learn what the SINGLE MOST DAMAGING AND DANGEROUS THING you're doing to your body right now is: Rid your body of this in less than five minutes. 5. You'll find relaxation and power in the amazing Taoist Deep Drop Meditation: It's probably the most important meditation of all: one that will keep you healthy in mind, body, and spirit – and, YES, will make you effortlessly charismatic and better looking, by drawing energy to your face – bringing your eyes alive, making you sparkle, giving you the superstar glow! 6. You'll learn the awesome art of Wu Wei – the Taoist art of "effortless manifestation": you’ll learn to guide your inner intelligence so that what you want is clearly defined and manifests into reality flowing like water, following the path of least resistance. 7. You'll gain tailor-made Taoist affirmations to manifest health and abundance in your life: Manifesting Your Perfect Success – Health – Love – Relationships – Perfect Wealth & Abundance – and Your Perfect Good Looks. All tried and tested and proven to work, by the Barefoot Doctor and hundreds of his students. 8. Incredibly – this would astonish Einstein – you'll learn how to expand time: You need never miss a deadline again! One of the many "magic" tricks of the Taoists. 10. You’ll learn to enjoy happiness, deep relaxation, and unstressed success at all levels. 11. Most important of all: You'll discover a deep understanding of the meaning of life, "what it's all about," and where real satisfaction is to be found: you’ll learn the Taoist theory – proven over literally thousands of years – and then you’ll be guided to the place where you can experience yourself as part of the power, as part of the dance. Then you'll be invincible, my Warrior friend! As you'll learn on your first CD – the entire universe is based on the vibrational frequencies of sound. Audio CDs provide the perfect way to teach you the immensely powerful Tao healing sounds ... essential for flooding your body and spirit with all that unstoppable, limitless energy. But perhaps most important of all, your CD study course means The Barefoot Doctor can be in the room with you whenever you need him. Explaining the finer points of how you can bring new wealth and wonderful friends into your life. Guiding you through the precise self-healing session your body needs, just when you need it. Sharing an amazingly invigorating visualization that makes success in any plan a 100 percent certainty. The Tao means… road, path, way. It’s the way in which one does all things. It’s a way in which life should be ordered; it's the way the universe works . . . it’s the way to make your life work! The Tao is ever-present, but must be manifested, cultivated, and perfected in order to be realized. When accessed, the world becomes literally invigorated by the Tao's radiance. It’s the way of the Urban Warrior. The Tao is real. It is deeply, provably present! You can see it; you can feel it. Now it's your turn to reap the profound benefits of connection to the Tao. P.S. Remember that most important meditation of all that I told you about (point 5), which, on its own, will start to balance your body and spirit and fill you with energy, health, and effortless, charismatic good looks? I'm so eager to share the Barefoot Doctor’s teachings with you because I know just how much difference it can make to your whole life, quickly and effortlessly. YES! I want to take control to perfect my own health, wealth, happiness, and good looks – all by discovering the ancient powers of the Tao. 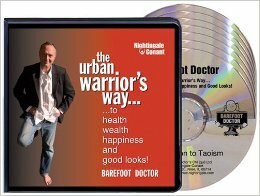 Please send me the Barefoot Doctor's 6-CD audio program The Urban Warrior's Way to Health, Wealth, Happiness, and Good Looks for just $69.95, which is $165 OFF the regular program price. If I don't find this program to be life-changing, I will simply return the program within 30 days for a full refund. No questions asked.